An Indonesian aircraft with 189 people on board has crashed into the sea as it tried to circle back to the capital, Jakarta, from where it had taken off minutes earlier. Officials have said it is likely there were no survivors from the crash. Rescue officials said they had recovered some human remains from the crash site, about 15km off the coast. "An RTB was requested and had been approved but we're still trying to figure out the reason," Soerjanto Tjahjono, head of Indonesia's transport safety committee, told reporters. Search and rescue agency head Muhmmad Syaugi told a news conference that no distress signal had been received from the aircraft's emergency transmitter. At least 23 government officials, four employees of state tin miner PT Timah and three employees of a Timah subsidiary, were on the plane. A Lion Air official said one Italian passenger and an Indian pilot were on board. Mr Sirait declined to specify the nature of the issue but said none of its other aircraft of that model had the same problem. Lion had operated 11 Boeing 737 MAX 8s and it had no plan to ground the rest of them, he said. On tarpaulins at Jakarta's port, officers laid out items retrieved from the sea ranging from oxygen bottles to personal belongings such as wallets, a mobile phone, cash and backpacks. Transport Minister Budi Karya Sumadi said nine body bags had been taken to a hospital for identification, though officials said they contained body parts, not intact remains. A Reuters witness saw more body bags arriving at the port. The plane went down in waters about 30m to 35m deep. 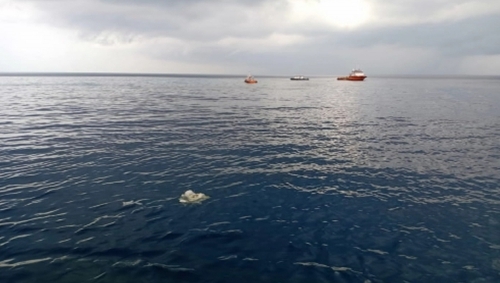 Bambang Suryo, operational director of the search and rescue agency, said divers had stopped the search for the night, but sonar vessels would continue hunting for the fuselage, where many of the victims were believed to be trapped. An underwater drone is also trying to find the wreckage, he said. The flight took off in clear weather at around 6.20am and was due to have landed in Pangkal Pinang at 7.20am. A Lion Air executive said the airline had flown 98 relatives to the capital from Pangkal Pinang. President Joko Widodo told a news conference authorities were focusing on the search and rescue, and he called for the country's prayers.